The national sport of Japan since 1909, sumo wrestling has roots that extend back 1,500 years. Archeological evidence suggests that sumo was part of prehistoric agricultural rituals performed to appease the gods and ensure good crops. 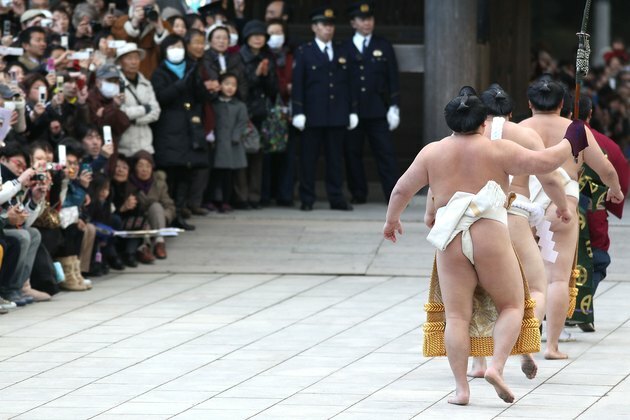 Sumo has been used during royal ceremonies for centuries and today is a popular professional sport. Sumo wrestlers wear a “mawashi,” a heavy fabric loincloth that opposing wrestlers use various maneuvers to grab and hold onto to gain an advantage during matches. “Rikishi,” Japanese for “strong man,” eat, sleep and train year-round in a “heya,” a sumo stable of about 15 wrestlers. Each wrestler’s training schedule and daily routine depends on his rank in a strict hierarchy. Even the mawashi of lower-ranked wrestlers must be made of different fabric than mawashi worn by higher-ranking wrestlers. The lowliest wrestlers do all the work, including cooking and serving the “chanko-nabe,” a rich vegetable and meat stew served with rice. Sumo wrestlers eat only two meals a day but consume enormous portions and take after-meal naps to gain weight. The mawashi is a thick, 30-foot-long belt that a wrestler wraps around his body several times and securely knots at the back. Sumo wrestlers believe life experience disappears in the wash, so mawashi are never laundered. Wrestlers wear canvas mawashis while training. During tournaments, top-ranked wrestlers wear different-colored silk mawashis while lower-ranked wrestlers are limited to black cotton. Depending on individual style, a wrestler’s mawashi might be tightly wrapped and difficult for opponents to grip or loosely wrapped with enough slack to deter an opponent’s quick jerk. The sumo hierarchy separates wrestlers into numerous divisions within many ranked groups. Wrestlers don’t earn a salary until they reach the lowest division in the top-ranked “sekitori” group. Rikishi wear a traditional Japanese kimono or “yukata,” a light, cotton dressing gown, when they leave the heya. Their hair is worn in a “chonmage,” or topknot, at all times. Sekitori wrestlers wear elaborate “oichomage” topknots that resemble a gingko leaf. During introductions at tournaments, sekitori wear a “keshomawashi,” a floor-length, extravagantly embroidered apron-like garment. A grand champion “yokozuna” sumo wrestler has a private entrance to the ring at official tournaments and exhibitions and wears a “tsuna,” a rope with five hanging strands of diamond-shaped, paper rectangles, when presented to the audience. The tsuna gives the yokozuna a semi god-like status and the right to participate in many religious ceremonies. Shogun Yoshida Oikaze first granted the title of yokozuna and the tsuna as a symbol of strength and dignity to two sumo wrestlers in 1789.